The suffering is a good, but completely offensive title that makes you play as a serial killer when death row is invaded by monsters. First off, the game is dark in nature and in lighting. It is a bit difficult to see certain aspects of the game because of this lighting, but adds to the terror of the well-made but horrifying creatures. The character models are average but the game boasts an overall great atmosphere with its lighting and smoke. You will be guessing around every turn. I give it a B, just for its creepy atmosphere. A highlight for this game. The sound score is the norm for slashers, and well, this is an interactive slasher so it works. The voice-overs are good and add to the terror as the screams are heard while being attacked in the darkness. Overall the sound is great and fits the atmosphere. I give it a B+. The controls are passable, like the rest of this game. You walk with the left analog stick and aim with the right, a norm for all X-box games. Only real problem is the inventory system which requires you to press the d-pad to change them. This is hard to do when a 4 legged creature has just jumped out at you from a dark corner. I give it a C+. The story revolves around a murderer who killed his family in cold blood and now lives on death row. All of his roommates (seen only in the opening cut scene) are murderers or child molesters. They talk opently regarding their crimes in ghastly detail. Every character in the game mutters the \'F\' word, the \'S\' word or the \'N\' word multiple times. The game is also very gory including creatures who lose their heads and keep coming at you. We also see a man getting injected with lethal toxins and shortly dies from it. There are ghosts that help your main character turn into his \'inner-beast\'. When in this form, you literally dice things in half and blood sprays. The main character constantly has two voices speaking to him one a woman (good) the other a demon (bad). They tell him to do things such as kill people around him. I give it an F-. Overall, \'The Suffering\' is an offensive title about serial killers who enjoy what they are doing and have no plans to change. 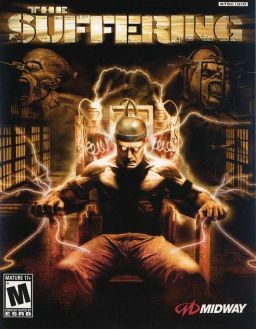 This game was definitely aimed towards desensitized teenagers and adults. The overall game is good, but the content is far from it. Play at your own risk. I give it a 75%.